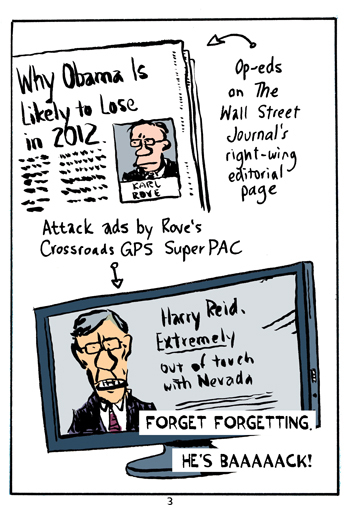 “Why Obama Is Likely to Lose in 2012” is the title of a column Karl Rove wrote in the Wall Street Journal in June 2011. The smell of freshly laundered white sheets, brown shirts, and sulfur is unmistakable: The key to Republican victory, in the Carolinas and nationwide, then, is making sure black people don’t turn out. Or, if they do, that they’re turned away. Or, if they can’t be turned away, that their votes are not counted. If Rove can stand in the polling station doorway and block three million voters from entering and bulldoze another three million ballots into a landfill he can make the Ice Man’s dreams come true. I can report that Rove is well on his way to success, and he’s only just begun. How Rove and his compadres set out to do that””eliminate six million votes and voters””and how he and his partners have done it in the past to black voters, Hispanic voters, students, Jews, and any kind of Blue-ish voter”” that’s the story you’ll get here. And not just Rove’s sleight of hand, but deliberate ballot-burgling done by others in the GOP and””cover the children’s ears!””Democrats too. But Griffin’s not in jail, he’s in Congress. Rove is not in prison, either. According to IRS records, he’s director of a nonprofit “social welfare” organization. American Crossroads GPS, tax-exempt under section 501(c)(4) of the tax code, aims to improve society’s welfare by dragging Democrats out of their seats in Congress and removing The Black One from the White House. Let me be clear: whether Obama is reelected, that’s none of my business. As a journalist, I stay clear of cuddling up to candidates of either party. Who gets elected, well, that’s your problem, gringo. I’m a reporter, and it’s not my job to preserve Democrats. But preserving democracy, with that fragile little d, that means something to me. Greg Palast is the Author of the recently published, acclaimed book Vultures’ Picnic and the New York Times Bestsellers Armed Madhouse and The Best Democracy Money Can Buy. Palast’s brand new book Billionaires & Ballot Bandits: How to Steal an Election in 9 Easy Steps, will be out on September 18. You can pre-order Billionaires & Ballot Bandits from Barnes & Noble, Amazon or Indie Bound. Author’s proceeds from the book go to the not-for-profit Palast Investigative Fund for reporting on voter protection issues. Or donate and can get a signed copy of the book. MEDIA requests (Interviews, Review Copies, excerpts etc.) contact us.